Sunday Stills: How Do You Get There? Even if we are not working a full-time job I think we all experience a commute. My work commute to the university is just under 5 miles, but if I hit the time wrong, a 10-minute drive can be a frustrating 30-minute commute. For those lucky folks who are really retired, does driving a car in traffic bother you? For me, mostly having to drive one-two days a week, I have lost the tolerance for heavy traffic. 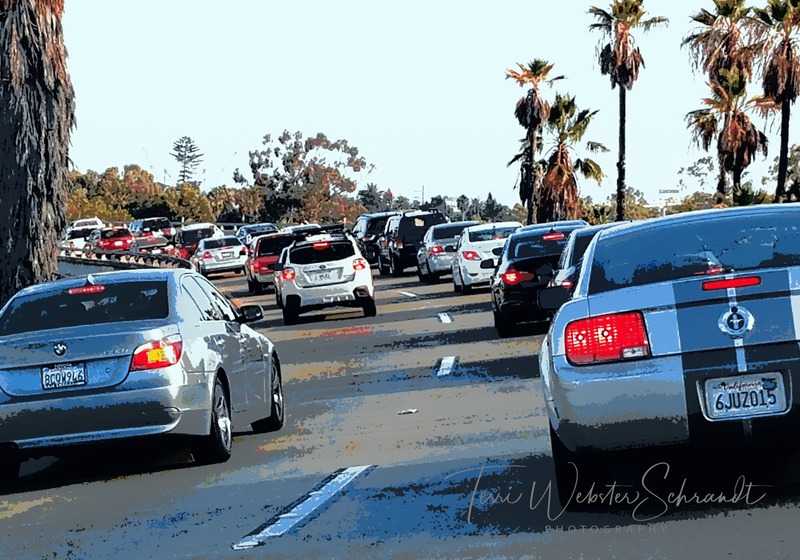 On our vacation to San Diego, we encountered the usual 5:00 traffic driving from the airport in downtown San Diego out to the East County. Commuting aside, what modes of transportation do you use? To get to where we are going, we drive, walk, bike, ride the train, take the bus, fly in a plane, ride in a boat, paddle on a lake…well, I’m sure you get the idea and can perhaps find a suitable image to share! You can see in the featured image the interesting shadow from our Southwest Airlines jet on the ground as we took off. Image post-edited with Painnt. Do you think only people need transportation? I guess that depends, but smart, urban turkeys simply walk around our streets, sweet as you please. I’m sure there is a “chicken crossing the road” joke in there somewhere…but I’ll leave that up to you. 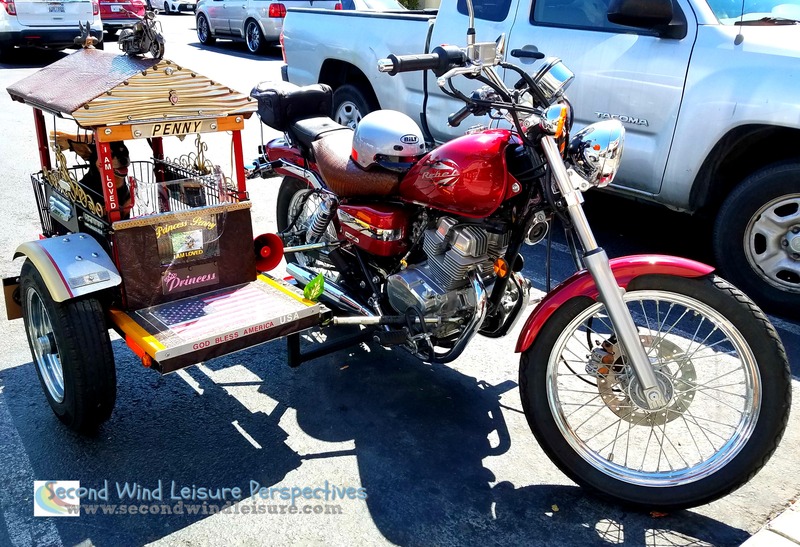 In August, conducting some business in a delta town, we saw this cute motorbike complete with sidecar parked in front of a restaurant. If you look closely, Penny the Pooch is waiting patiently for her driver to come back. September weather in Northern California still permits lots of outdoor activities. 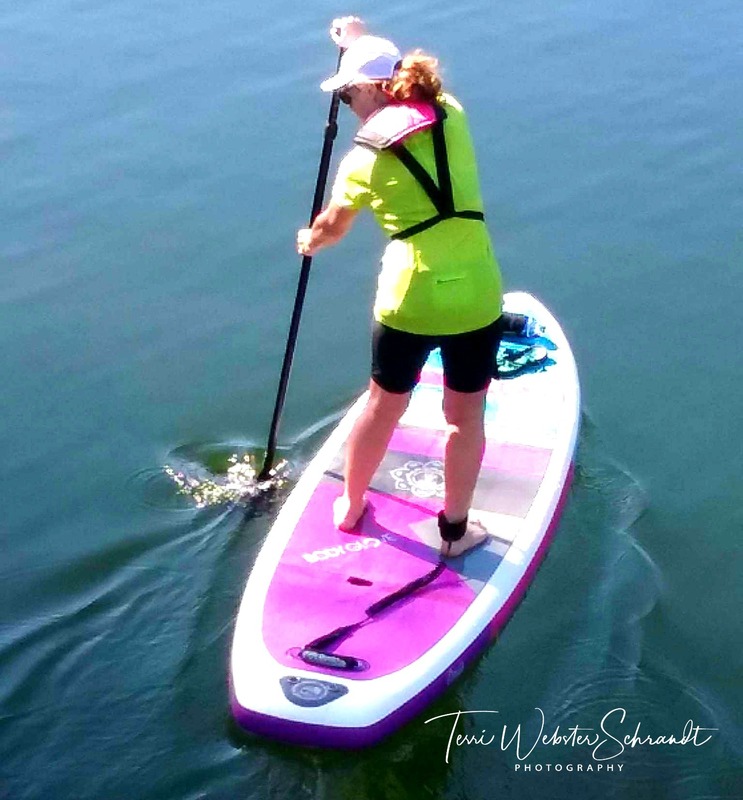 My hubby and I transported his bicycle and my inflatable SUP to a nearby lake and enjoyed some fabulous leisure time. He took this photo of me from the bike bridge that crossed a part of the lake. In 90 minutes, I SUPped to spots on the lake I hadn’t visited before. The photos of the pink motorbike and my pink SUP were partially inspired by Becky B’s Square in September challenge where “pink” is the theme. This is the last day for this theme and it was quite fun! With folks all over the world now participating in Sunday Stills, this will be interesting to see how people move around to get to where they need to go. October themes are available on the Sunday Stills page. Link up if you wish, but please leave a pingback to this post so I can share your lovely posts! What great photos and a fun prompt. I mean to share my photos every week and then life gets in the way. Finding it hard to keep up with anything right now. Checking out this week’s prompt. Thanks, Leslie! You are one busy lady, so no worries! Your featured photo is such an amazing shot because of that colorful patchwork! Now that would be somewhat frustrating, Aixa! Thank you! Love those turkeys! Thanks for sharing these fantastic photos. So interesting to think about so many methods of transportation. We recently visited Greenland which doesn’t have any roads between the towns and villages – so the people rely on boats and helicopters for transportation. Thank you, Toni! It IS interesting, and even more so about Iceland! I’ve done a lot of commuting over my years, my favourite being the London Underground (when it’s not too busy or hot). As a child, I always saw the London Underground (or Tube) as the transport of the future, but only because of what I had seen on the TV show Thunderbirds. These days, my mode of transport tend to be walking, cycling and the car (although I’m far happier at being the passenger rather than the driver in a car). You paddle on the lake looks very refreshing, Terri. And how cool at having wild turkeys in the neighbourhood. Do they do any damage to the gardens, like eating all the produce? Oh I wish California had better transportation system, at least in the vast suburbs. Biking in the “dedicated” bike lane means taking your life into your own hands, and forget walking anywhere. Some cities have good rapid transit systems but so many people on these trains are scary! European countries are so far ahead of the US in this regard. So far I haven’t heard any issues about the turkeys, but they can fly and actually roosted in our 200-foot pine tree in our back yard recently. 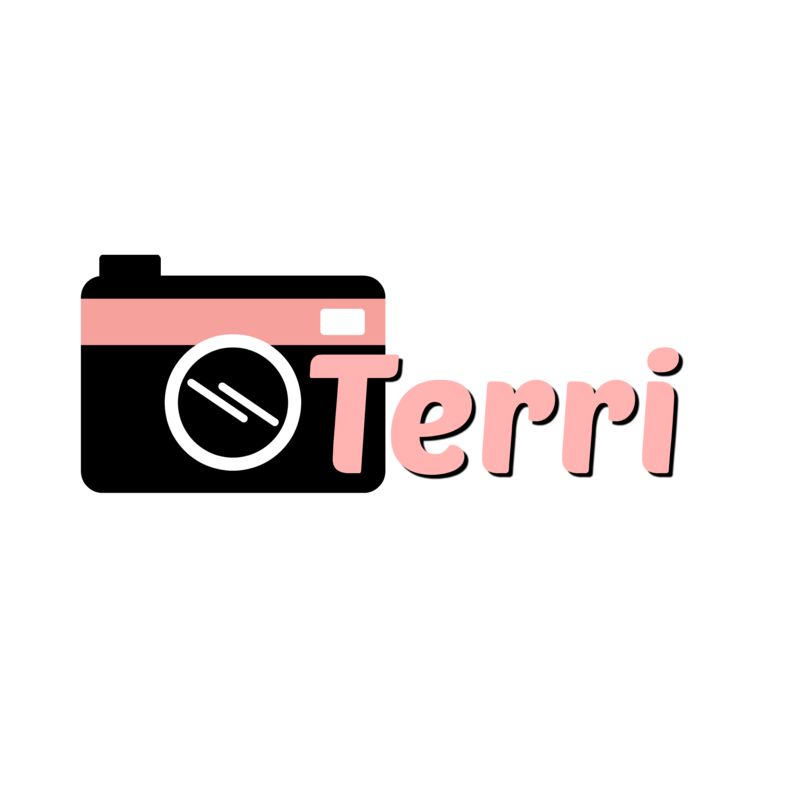 Hi, Terri – I have much less tolerance for heavy traffic than I ever did. My absolute favourite form of transportation is walking. I am grateful to live in a small town where I can walk for most errands! You are very lucky, Donna. Most American towns are mostly unwalkable. Loved the urban turkeys Terri! Cannot imagine dealing w CA traffic on a regular basis 😱. As for me, my bicycle is my favorite mode! I need to add my favorite commute ever! After senior high school I worked as a baker, at a restaurant that was located on top of a mountain. It was a seasonal job. In the morning I took a chairlift up on the mountain, that was relaxing itself, enjoying some marvelous views. My favorite was after the work day was done, I could ride my snowboard, zig-zag across the mountain, and end up in my backyard. That was the best commute I ever had! Now that is a cool commute, Maria! Sometimes the commute to the home office or around the corner to the other part of the house is just as delightful! So many ways of transportation! I currently don’t have a commute, since I am a live-in nanny. My favorite way of transportation would be on horseback, even if it’s not my “daily driver”. I’m trying to get back into blogging. I haven’t had much internet access lately and then things just keep interfering with my motivation. These challenges are really helpful. Here’s my post. I’m excited for you, Sue! Looking forward to hearing about your experiences. Hope the typhoon in Japan doesn’t slow you down! I’ve retired, it’s a wonderful life. I avoid rush hour traffic at all costs now. I spent too many years driving an hour each way in stop and go freeway traffic to want to do it now. Tomorrow we will fly to DC, flying isn’t any fun anymore either. Oh my gosh, I totally agree! Thank goodness my commute is very short, I was lucky for 14 years living close to my day job, but it wasn’t always that way! I find flying nerve wracking, not the flight itself (that I like), but the check-ins, lines, TSAs. West Coast roadtrips are my favorite things! 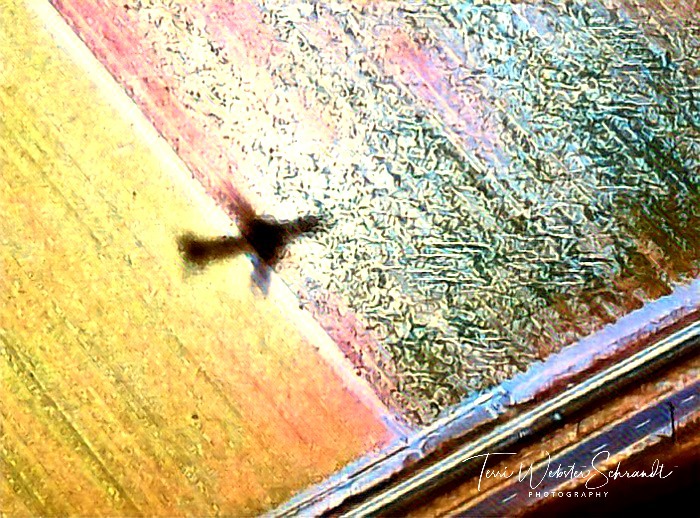 I particularly like the plane shadow photo for the colors and textures, and who doesn’t like turkeys crossing the road? My morning commute occurs around sunrise and is one of my favorite parts of the day. Ocean on one side, volcanoes ahead, windows rolled down, ideal temperature, not much traffic. If only my truck didn’t break down so much! Loved your post, Graham, thanks for submitting! When we flew to San Diego a few weeks ago, I knew the transportation theme was upcoming, so I took a bunch of shots. That jet shadow was edited with that new Painnt app I’m enjoying. Enjoy the app. Is that why I see Photo Editing in this month’s Sunday Stills? It is overcast and cool out this morning. Have a good week. Thanks, Becky, and for hosting a wonderful feature! I have to admit that the commute is something I don’t miss about being retired. It’s so easy to “walk” to the office and start on the blog…LOL!! 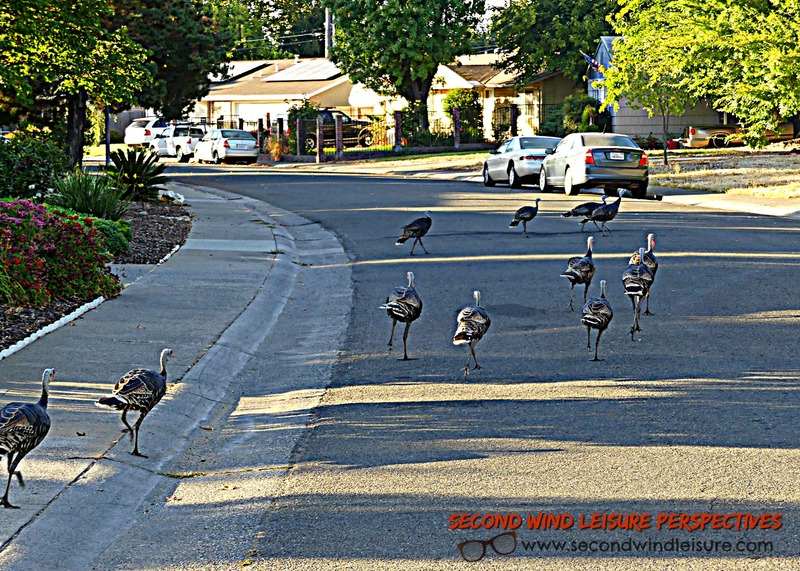 As for the turkeys….how fun to see nature right on your own street. I love my home office commute, too, Jodie! The turkeys are just so cool to see almost every day! What a wonderful collection of folks and critters on the go. I especially love the one of the plane’s shadow across the field but my favorite is of those turkeys out for a turkey trot. Are these fowl wild or is there a shepherd around nearby/ What a story lurks in this picture. Then there’s you, paddling on a lake of glass. Wonderful. Even your lovely comments are beautifully written, Shari! Thank you! The turkeys are wild and even roosted in our huge pine tree one night. I’m glad they feel tame and safe enough to hang out in the neighborhoods.